Not only that, but with each activity, we outline how to adjust the activity to be suitable for a baby and how to increase the challenge for older children. As moms with multiple children, we know it is hard to find activities that work for all of the children so we have done the brainstorming for you! We finish each week up with a list of books we recommend on the topic for that week. For each week, you will see a list of activities and the ways we recommend splitting them up for the week (though order is completely up to you). We also offer a list of supplies right at the beginning of each week so you can easily shop for the items you need. We then go into detail on each activity, complete with supplies needed, prep work to do ahead of time, steps to complete the activity, and pictures of each activity. When appropriate, we list ideas for frugal substitutions. We know money can be tight out there! We help you be creative with the supply list so you can get the activities done without breaking the bank. 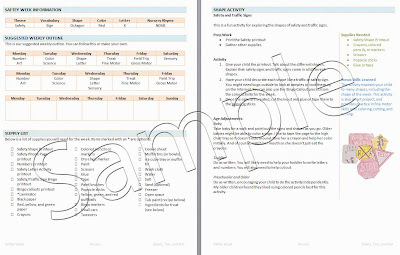 With our book, you will get not only the lesson plans, but you will also get all necessary worksheets for the activities we describe. With competition in schools becoming more intense, parents feel the push to teach their children before even starting them in preschool. Preschool is the new Kindergarten, and parents know it. But few moms have the time, experience, or patience to develop a lesson plan and compile activities that are age appropriate and effective. Learning blogs are without number, and a mom can find her time sucked away blog-hopping and sifting through the archives to come up with an activity for the day. This book gives mom all of the resources she needs to provide a full curriculum for a year, as well as guiding her to learn how to set up a curriculum on her own. This is valuable to homeschooling and public/private schooling moms alike. Moms are busy, whether they work from home, outside the home, or as stay at home moms, but they still want to be able to do it all, and that includes providing fun and engaging activities for their children. Learning activity blogs are very popular and quite numerous and provide countless ideas for things to do with children. Pinterest is also FULL of ideas! However, most moms get overwhelmed at how to structure learning time at home and how to organize these ideas the best way to provide well-rounded learning experiences. Furthermore, moms with more than one child want activities that can work for all of their children so learning time can be simultaneous. This book gives mom that structure and organization. It gives mom a weekly theme with activities to go along with each theme that suit children of all ages, and on a variety of subjects. Activities are varied and pull from tried and true ideas as well as a large number of new and unique ideas from the authors. People today want to be both independent and efficient. Our lesson plans provide a theme for each week, along with a weekly vocabulary word, shape, letter, color, nursery rhyme, and number. Each week has activities that focus on learning these skills, as well as combining fine motor skills, gross motor skills, sensory activities, and art. As appropriate, we also address music, history, geography, and other subjects pertinent to content and helpful to development. Families also need to be able to do these activities for as little money as possible. 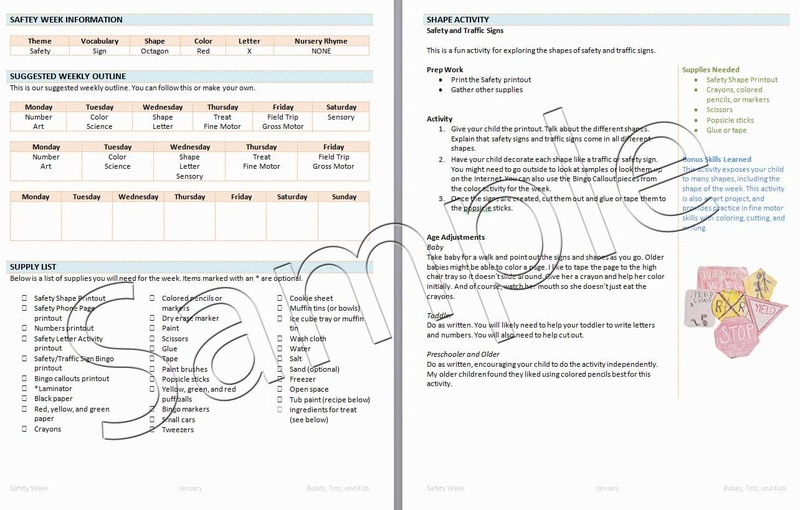 Moms with multiple children will want activities that do not take a lot of preparation time. Our activities use things people have around the house for the most part. All activities can be done very frugally. They also are easy to do. Mom will have time to do the activities with her children because all of her time will not be spent on the preparation. We have carefully considered many frugal substitutions for the activities in this book. The broad audience for this book is anyone who works with children who wants to teach them. Parents, preschool teachers, daycare providers, grandmothers, aunts, playgroups, etc. There are several “learning activity” books out there, and they are excellent. What sets this book apart from those? This book does the organization for the moms already. This book ensures the basic skills are fully covered over the course of a year—and even from week to week. This book provides not only the ideas to do, but lumps them into fun themed weeks and provides the activities to do each day of the week. Our eBook is $19.50 for all files. This includes instructions and worksheets. This sounds awesome! What is the cost? I don't see it listed anywhere. How do we receive the book? Is it emailed to us? I bought this ebook this morning, but still have not received the email with the book yet, although the I did receive my confirmation email. How long does it normally take to get it emailed out? I was hoping to start this next week, so I was hoping to get it soon so I have time to get supplies. Thanks!